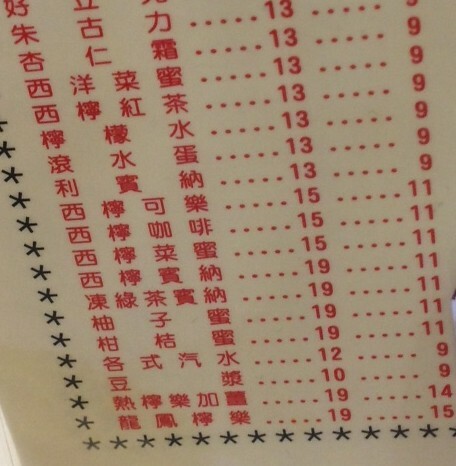 I was having breakfast at a local cafe in Hong Kong when I spotted a few unusual items on their beverage list. 1. 西洋菜蜜 - Watercress and honey. What? Vegetable in your drink? Wouldn't that be more of a soup than a beverage? 2. 滚水蛋 - Boiling water and egg. It is akin to our soft boiled egg except that it is served in a glass and topped up with boiling water. The variation is 奶水蛋 (right side of the picture right) where condensed milk is added to the concoction. I was wondering if you add boiling water to the soft boiled egg where you are supposed to stir the glass into a milky liquid, won't the taste be very bland? 3. 冻绿茶宾纳 - Iced Green Tea & Ribena. 宾纳 is short for 利宾纳 i.e. Ribena the blackcurrant cordial. These days we add green tea to everything from ice cream to biscuit to pumpkin seed to whisky. Green tea to Ribena is definitely a first for me.